Congrats! All that hard work paid off, and you made it. We're excited to celebrate your awesome accomplishment at commencement. But first, there are a few things you need to do. Complete a minimum of 120 term credit hours in required courses. Have a cumulative grade point average of 2.0 or better. Meet the appropriate residency requirements. (See student handbook for details). Complete and submit an application for graduation before the deadline for the term you intend to graduate. Seniors who fail to complete an application for graduation on time will not receive their degrees. For more specific information about Commencement 2019 visit the event page. Learn more about 2019 Valedictorian Mariah Zambuto and the 2019 Outstanding Seniors. Seniors are responsible for reviewing their completed coursework, with respect to graduation requirements, to ensure fulfillment of all degree requirements. This includes both your completed work at CCAD and any transfer credit from other institutions. It is your responsibility as a graduating senior to ensure that we receive all updated transcripts from other institutions prior to your last semester of attendance. All transcripts from other institutions must be addressed to the attention of the registrar. Your division deans and faculty advisors are not responsible for ensuring that you have completed the required courses. All candidates for graduation must have all delays of service cleared no later than two weeks prior to graduation. Any graduate with a delay of service will not receive service of any kind from CCAD, including the awarding of a degree or diploma, transcript service and other services requested. If you want to participate in the commencement ceremony and actually get your diploma during the ceremony, you must meet all deadlines, complete all academic requirements successfully and clear all delay-of-service holds. If you're a graduating senior and you have questions regarding your requirement status, contact your advisor or division dean, or stop by the One-Stop Student Services Office. Please remember that if you have any outstanding debts or have not been cleared by the offices listed below, all services will be delayed. That means you will not receive your degree, diploma or transcripts (for employment, graduate school, etc. ), and all other services to you will be stopped until the problem is resolved. Please use the following checklist to ensure you have cleared all areas prior to Friday, May 3. Student loan information: All students who had Federal Direct Student Loans and/or Perkins Loans while attending CCAD must complete an Exit interview with the federal government and CCAD. These are two separate loan programs. The Perkins loan exit interview can be completed by logging on to MyLoanCounseling. The Federal Direct Student Loan exit interview must be completed by logging on to StudentLoans.gov. CCAD will be notified electronically once you complete this process. Failure to complete the online loan exit interview process will prohibit us from giving you your degree. Your cap, gown, and generic commencement announcements will be available at the One-Stop Student Services Office about two weeks before the end of the term. We will send you an email announcing the pick-up date. There are a set number of generic announcements included in your graduation package. May 3, 2019: Final grades due for May graduates. You must complete all your degree requirements by May in order to attend commencement and graduate. Your grades are due from the faculty on Friday, May 3 by noon. We will distribute special graduate lists to faculty; however, please be sure to remind your instructors that you are a May graduate. You can check your grades online via Self Service. 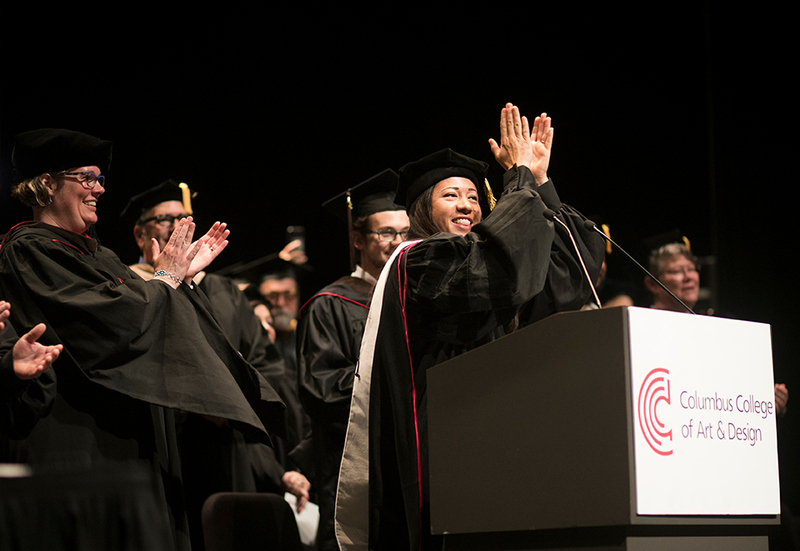 May 7, 2019: Commencement rehearsal for attendees is Tuesday May 7, 2019 at 1:30 p.m. Mershon Auditorium. Students enter in the back loading dock area. May 11, 2019, 9 a.m.: Graduates must be at the Mershon Auditorium. May 11, 2019, 10 a.m.: 140th Commencement Ceremony. Faculty who have reserved a seat on stage with Michele Kibler, please plan to arrive at the theater before 9 a.m.